THAT LEAD TO OIL BURNER FAILURE . Building insulation and tight construction, coupled with how the boiler was installed, can cause re-entry of products of combustion, a condition known as “Depressurization Induced Combustion Re-Entry." 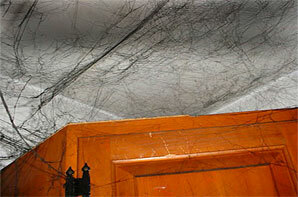 What appears to be some serious cobwebs in this photo is actually soot. An improperly serviced gas fired boiler or furnace can cause soot damage like this that can touch every surface within a home and create a situation that calls for costly remediation. 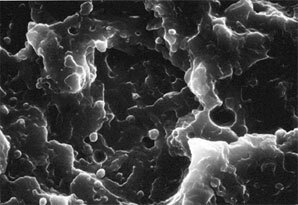 Using the high power microscopes in our laboratory, we are able to closely examine "soot like" particles we have recovered from a loss. By so doing, we can identify the origins of these particles to confirm that they are from a suspect boiler, furnace, or some other source. 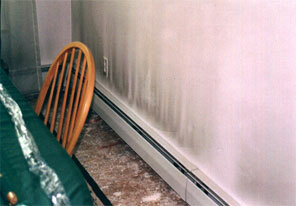 In this case, an oil burner issue caused soot to clog the boiler and create a discharge into the home. 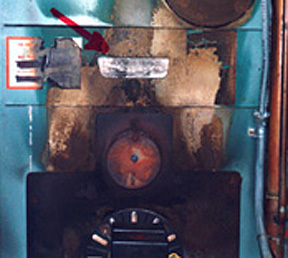 Cracked heat exchangers can be another victim of soot buildup. ISE's inspectors can readily determine if soot is the cause of a wide range of loss types.